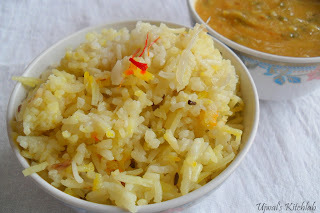 I love the variation in rice dishes.They are so easy to make plus, healthy and most of the times require no side dishes and can be made in jiffy with minimum utensils to be cleaned. This is one such dish that I was recommended by my SIL. I love Shilpa's site for the simple dishes and clear instructions. This is one such no fail recipe that tastes great on its own or even good with some spicy side dish. I had made this on my mom's birthday as she loves capsicum but never got time to post it until today. This has been in my drafts for really long time. I almost followed the recipe but made very minor negligible changes. Click here to view the original recipe from Aayi's recipes. 1) Heat oil add jeera when it splutters add the spices and onion, garlic and fry until golden. 2) Add capsicum and fry for a while. Add rice and green chillies. Fry and add 4 cups of water and salt to taste. After one boil lower the flame and cook covered. 3) When 3/4th done open and add the saffron milk and cook further till done. Fluff with fork and serve hot. We had with Dal fry. I make capsicum rice too .. have one in drafts to post :). Looks good. Well made - delicious all in one dish!! Loved the addition of saffron in there ~ sounds so flavorful! I stumbled onto this blog looking for shevai and I find that you have not been blogging for sometime. Will bookmark and hope you resume soon.